The facility department is the driving force behind an organisation. Well-organised facility management can make the difference and add value to the company. That is why nowadays the facility manager is a business partner on a strategic level. At Breda University of Applied Sciences you can enrol for the English-taught bachelor’s programme International Facility Management. In 3 or 4 years’ time, you will become a professional in the international facility industry. After your graduation, you are a team player who ensures that clients and visitors feel comfortable and your team feel welcome and productive. Right in the middle of things! Can you create the work place of the future in a sustainable way? Can you manage the catering, cleaning services and security in an international company? After your graduation in Breda, you as a Facility Manager are a team player who ensures that guests feel comfortable and staff can perform well in their work. The programme was voted as the best in 2015 by Elsevier (a renowned Dutch magazine) and No.1 in its category in the Nationale Studenten Enquête (Student Survey) 2016. According to Keuzegids HBO 2015 (Dutch) Breda University of Applied Sciences is the best large university of applied sciences in the Netherlands. 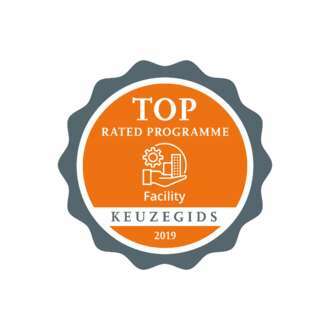 Keuzegids HBO 2016 also ranked the International Real Estate and Facility Management programme first in its own category (with a score of 7.6 out of 10) and gave this programme the qualification top rated programme. International Facility Management has been awarded a label of excellence for close collaboration with the facility management industry by the Dutch Government and has received an international accreditation by the International Facility Management Association (IFMA). The British Institute of Facilities Management (BIFM) has recognised NHTV as a BIFM centre, the first one in mainland Europe. As a result, Breda University of Applied Sciences is qualified to award the level 5 diploma in Facilities Management to its students of International Facility Management. The Dutch-Flemish Accreditation Organisation (NVAO) has awarded International Facility Management furthermore with the distinctive feature of ‘Internationalisation’.